Most pale ales out there in the world would never attempt to swindle you out of your recent pay check, or even your precious jade cat statue your great aunt. 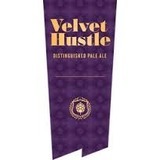 Using a subtle combination of Victory and Honey malts for a smooth greeting followed by a sly, sharp stab to the palate of robust American hops, Velvet Hustle will easily work its way into your home and then steal your heart. And your watch.